Jurgen Klopp at Liverpool has seemingly been a destined combination set up by the role one famous song has played in the history of both parties. It seems bizarre to think the German hasn’t been at the club longer given what a perfect fit he is and just how quickly fans and players have taken to his presence. Echoes of ‘You’ll Never Walk Alone’ come as something Klopp is well accustomed to by now having been subject to the song during his time at both Borussia Dortmund and Mainz prior to arriving on Merseyside. The tradition, the romance and the passion amplified by the famous anthem is what makes the Reds boss continue to admire his privileged position he feels is unrivalled by no other. “Maybe I’m the luckiest manager in world football because I had three teams [who sing it]. I’m a football romantic and I like tradition in football and all that stuff. In Germany, only two clubs sing ‘You’ll Never Walk Alone’ before the game and that is Mainz and Dortmund,” he told Spanish media outlet Marca. 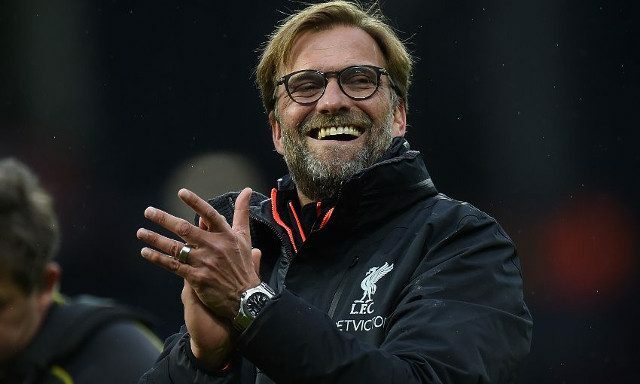 Within Klopp’s appreciation for the position he finds himself in, there is a timely and valuable reminder of how football can be a welcomed and a happy distraction from life at times. It’s this upbeat and incredibly positive approach that has seen Reds fans grow to adore to way he goes about managing this famous club. A truly special club with a special manager and special fans.